A former chairman of the National Population Commission, Festus Odimegwu, has lambasted the Nigerian political class, accusing government at all levels of corruption and ineptitude- failings he said are now enough for the Nigerian military to seize political power in the country. In an explosive interview published by ThisDay last weekend, Mr. Odimegwu said Nigeria had failed and that it was time for the military to intervene to save whatever is remaining of the country. PREMIUM TIMES got ThisDay’s permission to run excerpts of the the interview. Mr. Odimegwu, a former head of the Nigerian Breweries Plc, said Nigeria had shown it is not ready for democracy because of widespread violence, ineptitude, corruption and illiteracy, saying the country should instead go the way of Egypt, where the military ousted the country’s democratically-elected government in 2013. “Economically, things have gotten worse,” he said. “Politically, when you look around there are many signs that Nigeria is not ripe for democracy. It may not be a nice thing to say, but the signs are there. He outlined the problems of a nation he accused of celebrating corruption and mediocrity, and that is tottering on the brink of collapse. He said Nigeria as a state had failed already. He said what is left is armed conflict from all sides. He accused the government of not leading well and of not sourcing quality advisers. “Many of the people who have accepted to lead don’t know what leadership is all about. Many of them go there and surround themselves with fools. If you do not know what you are doing but you have men and women of substance that can look at issues critically and deal with issues the way they should be dealt with for the benefit of the country, then Nigeria would move forward,” he said. He said Nigeria’s recent status as Africa’s largest economy bears no effect on the people as Nigeria had already failed economically and politically. He said the present government at all levels stinks badly of corruption, and celebrates fraudulent billionaires who should have been executed. “In the past, you had people within the economic space that really added value; before you could say that this man is a rich man. Before in Nigeria, if you saw someone like Sir Odimegwu Ojukwu and they saw that he was a rich man with his Rolls Royce, everyone knew that he was a serious businessman and everyone knew the source of his wealth. “If you went further to check, you would see that he was paying his taxes. When you hear that Odutola was a rich man, all his neighbours knew what he was doing to be termed a rich man. The same went for others like Dantata and so on and so forth. But today, you have charlatans and rent seekers parading the landscape. Mr. Odimegwu spoke strongly against corruption, and said he has never stolen and never will, and called for capital punishment for corruption. “In Iran, they just executed a billionaire. There are many billionaires in Nigeria that should be executed. I don’t subscribe to Sharia law because I am not a Muslim. But I like that aspect of Sharia Law, like many people have said online. In Russia, Putin came and put the so-called richest man in prison because no one is above the law in sane countries. In Italy, Berlusconi, the former prime minister was taken to court and sentenced. Nigeria should learn from these things. It is not nice to say things like this, it is difficult for me to say these things but they are necessary. If people like us don’t say these things then who the hell will say it? After his term at the breweries, Mr. Odimegwu was appointed head of the population body by President Goodluck Jonathan in 2012. He left the office in October 2013 amid a controversy over his remarks that all past national census were fraudulent, and that he was set to usher in Nigeria’s first ever-credible census. In the interview with ThisDay, Mr. Odimegwu defended his position, and accused President Jonathan of not acting on a credible work plan he presented, and choosing political considerations over a genuine desire for change. He said instead of acting on his plan, Mr. Jonathan named a committee and that the vice president, Namadi Sambo, altered the plan. The president himself refused to act on the proposal, which was to cost N600 billion. “There and then, what I would have done, if I were him, was to approve what I had given him. But like most public officers, he set up a committee and a committee is a recipe for not getting things done. He gave the committee the mandate to do the analysis and come back to him in four weeks. After eight weeks, this committee was still talking nonsense. I recall I did 172 presentations at various levels during its sitting,” he said. He said eventually, the north hijacked the plan while the south introduced religion and other things into the proposal. The plan was to cost much because it would have gone beyond mere head counting, and would have required producing clear digital images for 200,000 localities in Nigeria. “You have to go into all these 200,000 localities and number all the houses inside them and produce a zip code for the country. You have to go inside every building and identify the households inside the residential buildings and produce a household register. “You have to hire up two million enumerators and train them on how to use the biometric machines to go and do biometric census of Nigerians. Then you have to get the companies that will give us these biometric machines to come and configure it to fit our environment. As a former head of the breweries, he said he remained comfortable and did not serve to receive salaries, instead that he used his money to run the establishment because he wanted to help save a dying nation. He said he fired a permanent secretary at the National Population Commission for stealing N470 million. Mr. Odimegwu said he resigned- and was not sacked- after it became clear the president was not comfortable with him, particularly after being attacked by the Kano State Governor, Rabiu Kwankwaso. He slammed the government for not acting to arrest insecurity and allowing those responsible for violence to go unpunished. “Someone will come out and say he is going to make the country ungovernable and he actually proceeds to make the country ungovernable by violence everywhere. Then you have the people in government who know the people that are making the country ungovernable and they are not doing anything to them. You have leaders who swear an oath of office and once they enter the office are no longer interested in the oath. “Everybody is only interested in their own selfish ends, to steal money thinking money is the ultimate measure of a man but when they get money they will see that they have murdered sleep because when you get money the wrong way, you would have murdered sleep. Mr. Odimegwu, who was prominent as a key player in former President Olusegun Obasanjo’s government denied supporting Mr. Obasanjo’s third term bid. He said in his capacity as an informal adviser to Mr. Obasanjo, and at the same time being in the private sector, supporters of the extension of the administration’s tenure merely exploited his closeness to the former leader, and used his name. With the extent of the rot in Nigeria, he said, accepting quality leadership was the only way out. He denied not coming out for election to serve, saying the political parties frustrated him. “I came out to contest. (Former CBN Governor Charles) Soludo came out to contest in Anambra State and a lot more good people have come out to contest in some other states…. But the corrupt people in the system will sabotage those good ones,” he said. A first class graduate of industrial chemistry, Mr. Odimegwu lavishly vaunted his accomplishments, and didn’t seem to bother about public reaction to his remarks. He said his interest in government transcended wealth as he was already wealthy. “When I went to Abuja, I went to serve our nation to make sure we have progress as a nation because I am qualified to serve and I can do without a salary. When you see my house, would you say I am a hungry man? I have been living in Ikoyi since 1982. I went to Abuja, I went whole heartedly to help, but what now happened? The public space is filled with people who take rubbish and are rubbish and continue to live in rubbish. He tackled the media too, accusing many journalists of ineptitude. “Let’s even look at the press or the media how many of you people are serious? You can do your analysis. There is this (Akin) Osuntokun that I know is very brilliant. How many people that write in public space are like that? Look at when Soludo was writing, El-Rufai the same thing. But these are serious minded people. El-Rufai is brilliant even if I don’t agree with everything he says because he has his political side. But 80 per cent of the time he is a serious guy. People should listen to such people whether they are in government or not. 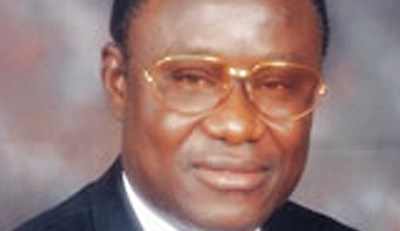 Mr. Odimegwu criticized the National Assembly for constantly “summoning” government officials. “Then they have some small, small boys there in the House of Representatives summoning people. Summoning who? (Hisses) I say damn you! You cannot summon me. The people you can summon are the criminals. I am not surprised that government officials are now refusing to answer such silly summons unless the president allows it, because it is a caricature of democracy. He tackled the north for not dealing with Boko Haram that has killed more than 12,000 people in five years. “Look at the north that is supposed to be getting the advantage. Is the north better than the south? Is it not sheer foolishness for anybody from the north to think they have advantage in the current Nigeria, when all this mess (the insurgency) is happening in the north. Every sensible person in the north should support that Nigeria should be modernised and we should have data to plan Nigeria very well, so that Nigeria as a whole will move forward together in progress. No north, no south!